Mark 9:2-10 Six days later, Jesus took with him Peter and James and John, and led them up a high mountain apart, by themselves. And he was transfigured before them, 3 and his clothes became dazzling white, such as no one on earth could bleach them. 4 And there appeared to them Elijah with Moses, who were talking with Jesus. 5 Then Peter said to Jesus, “Rabbi, it is good for us to be here; let us make three dwellings, one for you, one for Moses, and one for Elijah.” 6 He did not know what to say, for they were terrified. 7 Then a cloud overshadowed them, and from the cloud there came a voice, “This is my Son, the Beloved; listen to him!” 8 Suddenly when they looked around, they saw no one with them any more, but only Jesus. 9 As they were coming down the mountain, he ordered them to tell no one about what they had seen, until after the Son of Man had risen from the dead. 10 So they kept the matter to themselves, questioning what this rising from the dead could mean. 2 Kings 2:1-12 Now when the Lord was about to take Elijah up to heaven by a whirlwind, Elijah and Elisha were on their way from Gilgal. 2 Elijah said to Elisha, “Stay here; for the Lord has sent me as far as Bethel.” But Elisha said, “As the Lord lives, and as you yourself live, I will not leave you.” So they went down to Bethel. 3 The company of prophets who were in Bethel came out to Elisha, and said to him, “Do you know that today the Lord will take your master away from you?” And he said, “Yes, I know; keep silent.” 4 Elijah said to him, “Elisha, stay here; for the Lord has sent me to Jericho.” But he said, “As the Lord lives, and as you yourself live, I will not leave you.” So they came to Jericho. 5 The company of prophets who were at Jericho drew near to Elisha, and said to him, “Do you know that today the Lord will take your master away from you?” And he answered, “Yes, I know; be silent.” 6 Then Elijah said to him, “Stay here; for the Lord has sent me to the Jordan.” But he said, “As the Lord lives, and as you yourself live, I will not leave you.” So the two of them went on. 7 Fifty men of the company of prophets also went, and stood at some distance from them, as they both were standing by the Jordan. 8 Then Elijah took his mantle and rolled it up, and struck the water; the water was parted to the one side and to the other, until the two of them crossed on dry ground. In the last several weeks, different people from this congregation have asked me what I think of The Interim Process. The number of times I’ve been asked is translates in my mind as a tip-of-the-iceberg kind of number; meaning that more of you likely have a similar question and just haven’t had a chance to ask it. Let’s get everyone here up to speed on what is meant by “The Interim Process” before I tell you my answer to their question. Last June 8th, Pastor John Pederson retired as the Senior Pastor of 15 years. In late August, we welcomed Pastor Tim Drom as the Interim Senior Pastor. In addition to working as the Senior Pastor, his main task is to guide a team of Augustana people in leading us through the transition to a calling a new Senior Pastor. This team of people is appropriately named the Transition Team. They are compiling information from questionnaires, staff interviews, committee interviews, and more, to be able to describe this congregation’s current moment and envision its future. The Transition Team will hand off their work to a yet-to-be-formed Call Committee who will begin interviews. The Interim Process ends when a newly called Senior Pastor begins their work here. Look at Elisha. He’s about to enter a transition and those pesky prophets almost seem to apparate in Elisha’s path. They pop up in Bethel to tell Elisha that Elijah is going to be taken away from him. His reply? “Yes, I know, keep silent.” They pop up in Jericho to tell Elisha again that Elijah is going to be taken away from him. His reply? “Yes, I know, keep silent.” He longs to spend every last minute of the time remaining with his mentor, Elijah. In no way, shape, or form is Elisha looking forward to being without Elijah. It’s as if the council of prophets is already rubbing salt into Elisha’s fledgling wound. Not a “bring it on” in sight. Elisha’s longing to remain with Elijah is so great that he asks for a double portion of Elijah’s spirit before he is taken away. Many of us can relate to the longing for the person who gives us a sense of place and belonging. For Elisha, Elijah is that person. Look at Peter and the other disciples. Six days after Jesus teaches them for the first time about his being killed and rising to life again, they go mountain climbing with him. What must the week before must have been like after Jesus dropped that bomb on them? It’s as easy to imagine the behind-the-scenes conversations, nerves, and worry as it is to imagine their longing for time with Jesus to themselves. And look at Jesus. “He was transfigured before them, and his clothes became dazzling white, such as no one on earth could bleach them. All that dazzling Jesus light spilling out onto Elijah and Moses. All that dazzling Jesus light spilling out onto Peter, James, and John lighting up their longing for hope and peace. This is no subtle Epiphany – Jesus can and will be noticed. Peter’s reaction? Terror. Afraid and not knowing what to say, Peter babbles on about building tents for Jesus and the two prophets. He wants to bedazzle the moment that is dazzling in its own right. But this is not a moment to fix in time, setting up tents to keep the elements out. This is a moment that transfigures time, shredding the flimsy notion that protection is possible as past, present, and future collide on that mountaintop. Past, in the form of Moses and Elijah; present, in the form of Peter, James, and John; and future, in the person of Jesus, beloved Son of the eternal God, all come together. Transfiguration means change. 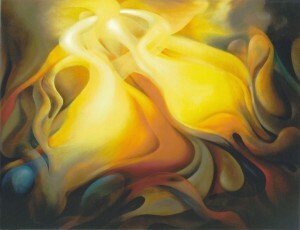 Or, more to the point for us today, transfiguration means transition which also includes the element of time. The Interim Process that began with the retirement of one Senior Pastor and will transition again with the call of a new Senior Pastor includes the element of time. Is it long? Yup. Is it long enough? We don’t know. Is it too long? We don’t know. Hindsight will get us closer to 20/20 on that answer. In the meantime, our temptation is similar to Peter’s myopia. We’re in the thick of the action which makes immediate perspective blurry at best. Transfiguration reorients us to Jesus who seems to hold some sway in the time-space continuum. And we are supposed to listen to Him just as the disoriented disciples in the fog on mountaintop are called to listen. In addition to the disciples’ call to listen, I invite us to ask the question they asked amongst themselves on their way down the mountain. And that is this, “What could this rising from the dead mean?” If God is a transfiguring and resurrecting God, then what might new life look for this tiny corner of God’s church-catholic called Augustana? Both during The Interim Process and beyond it? Let’s bring that question even closer to home because the dazzling light of Jesus shines, here and now, on you. So, given whatever is going on in your life, I ask again, “What could this rising from the dead mean?” If God is a transfiguring and resurrecting God, then what might new life be looking like for you? If you’re in a particularly blurry moment, like the disciples sitting in the fog on the mountaintop, disorientation rules the day but it doesn’t rule forever. A nod to the Harry Potter book series by J.K. Rowling. “Apparate” means to instantaneously disappear and reappear somewhere else.